In the spring we hold a Mad Hatter Tea Party in which we decorate our hats for spring and give a little nod to Alice and that Mad, Mad Hatter. In December we have the Witches' Wassail. 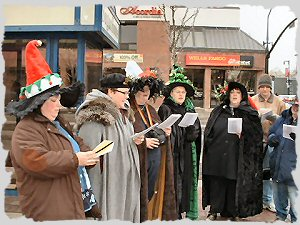 For this event we decorate our hats for Yule and go out on the town singing Yule carols. Stay tuned... there is no telling what we will plan next. Better still, come join us in the fun! The twelfth Witches' High Tea enchanting the lobby of the elegant Grand America Hotel with a myriad of Witchy Accouterment. 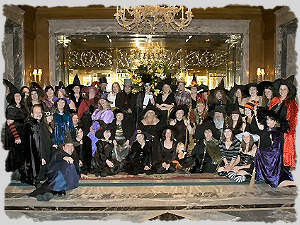 The eleventh Witches' High Tea flooding the lobby of the exquisite Grand America Hotel with a tsunami of Witchy Refinery. 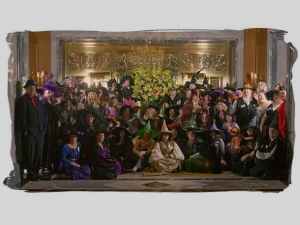 The tenth Witches' High Tea saturating the lobby of the beautiful Grand America Hotel with an overflow of Witchy Raiment. 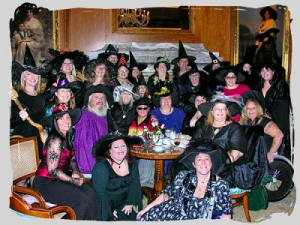 The ninth Witches' High Tea rivaling the beautiful lobby of the Grand America Hotel with the enchantment of their Witchy Magnificentness. 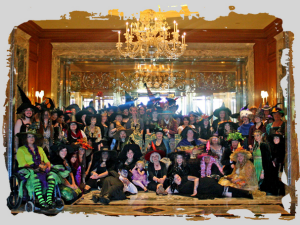 The eighth Witches' High Tea overflowing the elegant lobby of the Grand America Hotel with a torrent of Witchy Glamour. 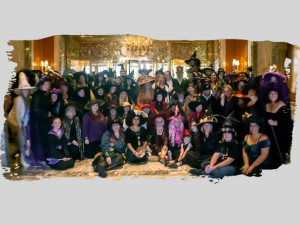 The seventh Witches' High Tea engulfing the exquisite lobby of the Grand America Hotel with a deluge of Witchy Haberdashery. 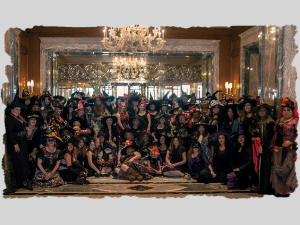 The sixth Witches' High Tea filling the lobby of the beautiful Grand America Hotel with a plethora of Witchy Regalia. The fifth Witches' High Tea at the beautiful Grand America Hotel transforming their lobby into a sea of pointy hats. 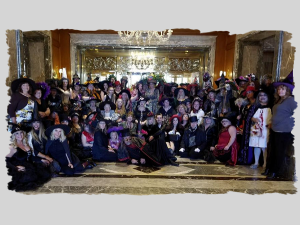 The fourth Witches' High Tea at the beautiful Grand America Hotel filling their lobby with even more Witches dressed to the nines. 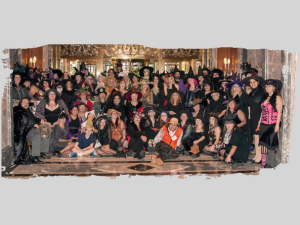 The third Witches' High Tea brought us back to the beautiful Grand America Hotel once again filling their lobby with Witches decked out in their finest. 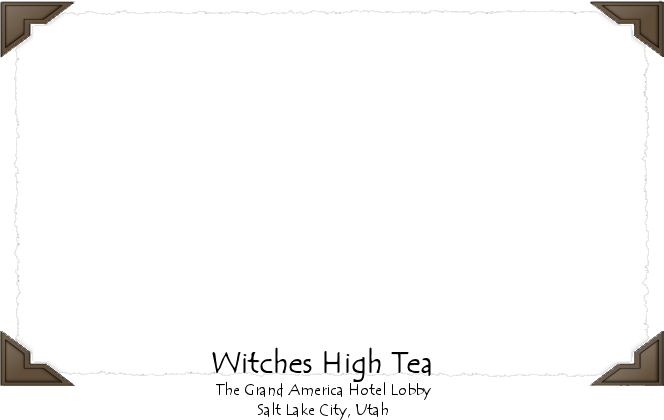 For the second Witches' High Tea we decided to hold the event at the fabulous Beehive Tea Room. Twas a lovely afternoon however this venue has a limited capacity and we were a bit cramped with the crowd that attended. 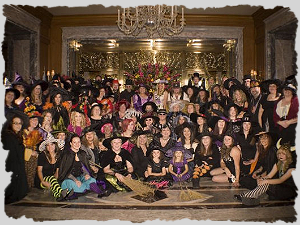 The first Witches' High Tea was held Friday, October 13, 2006 at the Grand America Hotel. 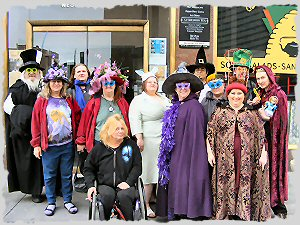 Twenty five Witches showed up in their finest formal witch wear for a delightful afternoon. 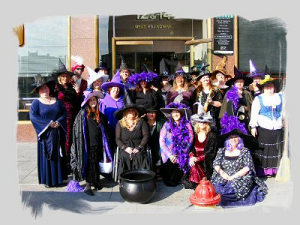 Join us for the 13th Annual Witches' High Tea on Saturday, October 20, 2018 @ 1:00 pm. Inquire at Crone's Hollow for details and tickets. 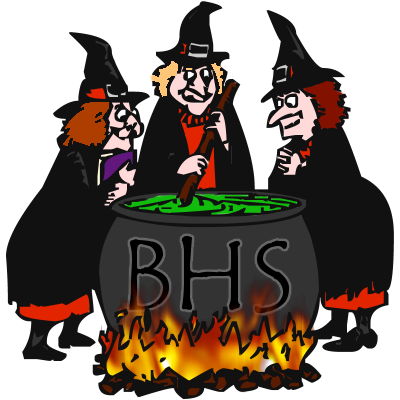 Double, double, toil and trouble; Fire burn and cauldron bubble. Accept no imitations! This is THE TEA everyone is talking about. The one covered by the Salt Lake Tribune and SLUG magazine. The one shown on KSL Channel 5 and Fox 13 news. The one that fills the Grand America's Lobby Lounge with a sea of hats! We hope you'll come join us! 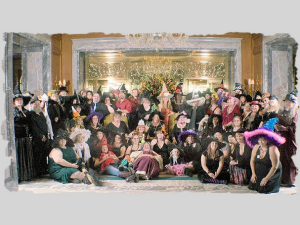 The Utah Black Hat Society is a group of Witches and friends who live a life of mirth and magick. We come together to share, learn and just have fun while taking a whimsical view of our tall pointy hats and celebrating who we are. Worn on the head witch hats are symbolic of wisdom and intelligence. The pointed form of the witch's hat represents the cone of power. The cone of power is associated with the circle, the symbol of the sun, unity, eternity, rebirth and the triangle. 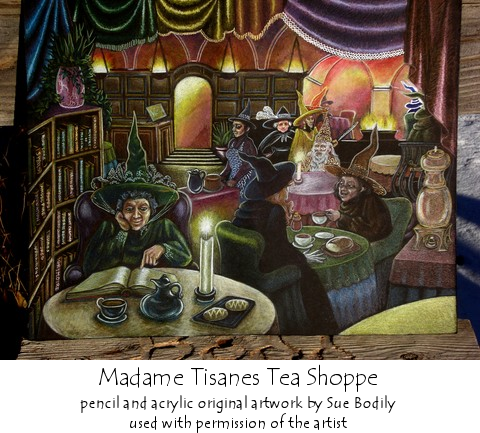 Watch our facebook group or check in at Crone's Hollow for events such as The Witches' High Tea, The Witches' Wassail, The Mad Hatter Tea Party and whatever other mischief and mayham we can think of. We are here to connect, socialize, and just have a good time. Trolls need not apply. Happy Flying!!! 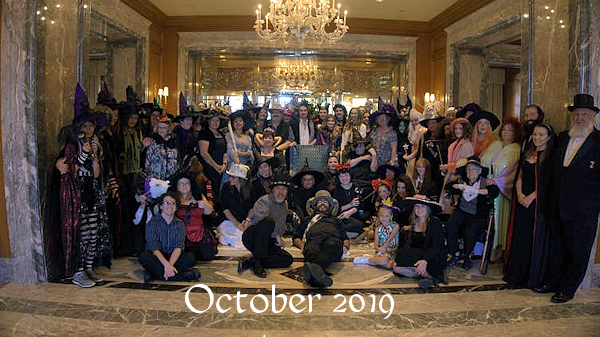 Our signature event is the Witches' High Tea held every October. Graphics, Text, and "Look & Feel" Copyright © 2006- Utah Black Hat Society, All Rights Reserved. While the Witches' High Tea is our signature event it is not the only event we host throughout the year.